Biggers’ report offers additional detail outlining the development of the Daishan airfield. He notes, for example, that “according to historical imagery, China began renovations at the airfield patching concrete runway tiles and removing encroaching vegetation between mid-2010 and 2013.” This suggests longer-term planning for UAV use in the context of the East China Sea, even before Chinese President Xi Jinping became president. In September 2010, the East China Sea issued flared up momentarily between Japan and China after a Chinese fishing boat captain was arrested by Japanese authorities in disputed waters after colliding his vessel with a Japanese patrol ship. 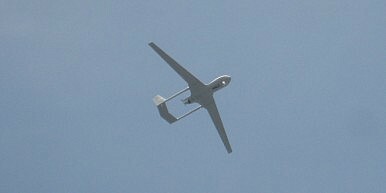 In October 2013, ostensibly to send a message, the Japanese defense ministry declared that it had received approval from Japanese Prime Minister Shinzo Abe to intercept any drones flying over Japanese airspace (this includes airspace above the Senkaku/Diaoyu Islands, as Japan does not acknowledge a dispute). Japan said that it would shoot down any drones that were “judged to pose a risk to Japanese nationals” after ignoring initial warnings from the ASDF. The Harbin BZK-005, described as China’s “Global Hawk,” does not carry any weapons and is intended primarily for intelligence-gathering, surveillance, and reconnaissance missions. It was developed in the mid-2000s by the Beijing University of Aeronautics and Astronautics and Harbin Aircraft Industry for use by the People’s Liberation Army-Navy (PLAN), and unveiled at the 2006 Zhuhai International Airshow. Recent reports in the Japanese press have suggested that China could ramp up its use of UAVs in the East China Sea to assert its maritime and territorial claims in the region.